Located on the southwest coast in Washington, Ilwaco is home to the World's Longest Beach. This historic fishing village offers a busy marina and the Columbia River which provides excellent fishing especially for sturgeon and salmon. 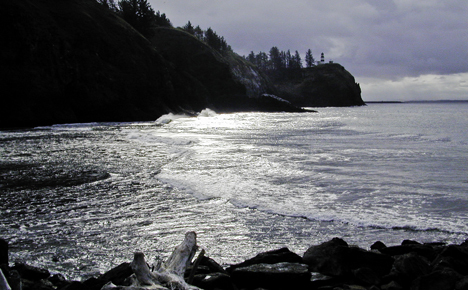 View of Cape Disappointment Lighthouse in the distance. Photo by Jack High, Go Northwest! North Head and Cape Disappointment Lighthouses are attractions you don't want to miss. Both lighthouses are fully functional. Discover the local history at the Columbia Pacific Heritage Museum or at the Lewis and Clark Interpretive Center. The southern end of the Discovery Trail is also located in Ilwaco which includes various monuments, metal sculptures and interpretive displays. Ilwaco hosts a number of festivals and events such as the Cranberry Festival, the Blessing of the Fleet and Blues and Seafood just to name a few. Find where to stay and eat and what to do and see and other information you need to plan your trip to Ilwaco.